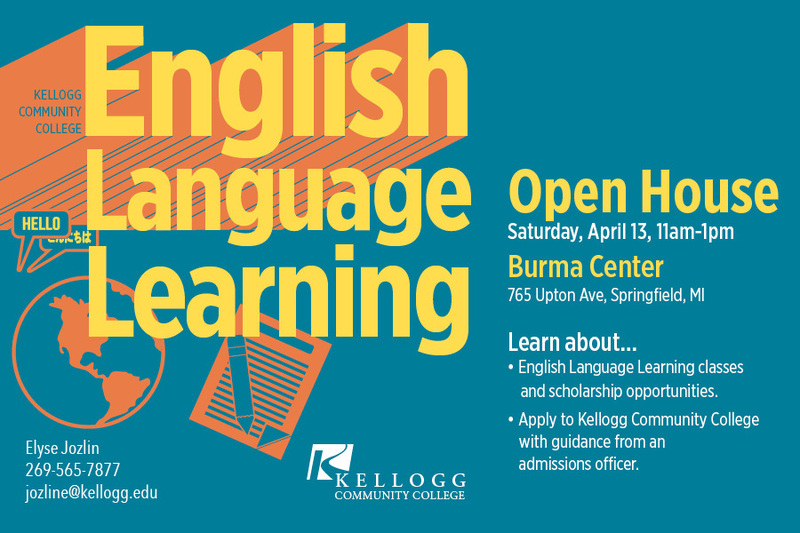 Kellogg Community College is hosting an English Language Learning Open House at the Burma Center this month to provide information and assistance to those interested in improving their English language skills and comprehension in classes at KCC. The free Open House will be held from 11 a.m. to 1 p.m. Saturday, April 13, at the Burma Center, 765 Upton Ave. in Springfield, and is open to anyone interested in learning more about ELL studies at the College. English professor Elyse Jozlin, who teaches many of the ELL classes at KCC, said the Open House will provide information about the classes and others offered at KCC this summer and fall. Jozlin will also go over scholarship information, and a representative from KCC’s Admissions office will be available to help anyone who wishes to apply to the College. KCC launched a series of intermediate and advanced ELL classes last fall, and added three introductory level classes in January. All levels of the four-credit classes are designed to help students improve their English language skills across categories including reading and writing; grammar and communication; and speaking and listening. The classes offer a great way for students to immerse themselves in the English language and become much more comfortable with their college content, she said. For more information about the English Language Learning Open House or future ELL classes at KCC, contact Jozlin at 269-565-7877 or jozline@kellogg.edu or visit www.kellogg.edu/ELL. Apply for admission to KCC. This can be done online at www.kellogg.edu/step1. For assistance, contact KCC’s Admissions office at 269-965-4153 or adm@kellogg.edu or visit the Hub on KCC’s North Avenue campus. Take the Accuplacer ESL exam. The results of the Accuplacer ESL exam will determine the level of coursework the individual student should enroll in. For more information or to schedule an appointment, contact KCC’s Testing & Assessment Center at 269-965-4136 or testing@kellogg.edu. Walk-in testing is available from 9 a.m. to 4 p.m. Mondays through Thursdays and by appointment Fridays, and a government- or school-issued photo ID (driver’s license, state ID, passport, high school, college or military ID) is required to test. For more information, visit www.kellogg.edu/placement. Learn more about the upcoming ELL Open House from KCC professor Elyse Jozlin in the videos below, with KCC student Rosemarie William translating in Burmese and student Yuki Wakabayashi translating in Japanese.